Guide books will tell you many things about Valletta, of its history, palaces, churches and architecture. Yet there is another source of great pride for Malta’s grand capital city that is unlikely to garner more than a mere mention: football. Champions last season and hot favourites again this time round, Valletta possess one of the strongest teams in local football. No one has won as much as they have in the past two decades with seven league titles and six national cups. 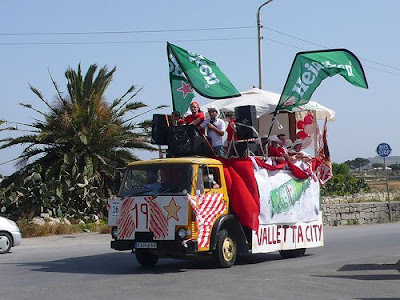 All of which helps fuel their fans’ passion, with Valletta’s supporters having a reputation of being among the most colourful on the island. Then again, the whole of Malta is in love with the game of football just as it has since the British servicemen introduced the game in the latter half of the nineteenth century. The British influence can still be felt till this day. Floriana FC, the oldest club on the island play in green and white striped shirts and are known as the Irish, a nod to the founding links with the Royal Dublin Fusiliers. Only one club has won more than Floriana’s twenty-five league titles and that’s Sliema Wanderers with twenty six. The Blues are expected to challenge for the main honours again this year, along with Birkirkara, Hibernians and Marsaxlokk, with the latter being managed by the former Ipswich, Arsenal and England international Brian Talbot. Special mentions go to St. George’s FC and Melita FC, two clubs with a rich history which today find themselves in the lower leagues. The first were one of the pioneers of the game in Malta with a league title win to their name, even though that goes back to 1916. Melita’s place in local folklore is retained by the strict adherence to the Corinthian values on which they were founded: till this day they remain the only truly amateur club in Malta with no one receiving any form of remuneration for their services. All of which adds to the rich texture of Maltese football where local rivalries are keenly contested events. Indeed watching domestic football in Malta is a unique experience not only because all top flight clubs use the same four stadiums to play their league football but because support is often boosted by brass bands and the atmosphere often mimics that of a village feast. Just as you would expect from an island madly in love with the game of football. This article was published in the October 2008 edition of Skylife magazine.